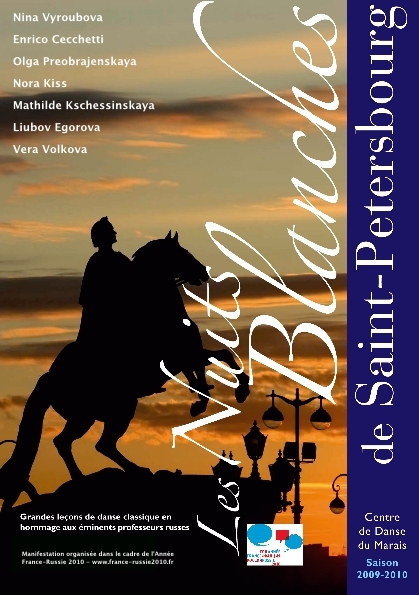 Polymath, patriot and irreducible moderniser, founder of Saint Petersburg, the inspiration for this first series of Master Classes at the Centre de danse du Marais, held from November 2009 to June 2010, is Peter the Great, the Bronze Horseman. The Classes are designed to celebrate the masters trained in the Maryinskii Theatre. Intent on the future and on educating its youth, these masters represent the core of theatrical dancing in the Twentieth Century. After the 1917 Revolution, it was thanks to these exceptional individuals that Paris (without, however, forgetting London!) became for over half a century, the beacon of classical dance, pantomime and character dance. Each Master Class is an experiment. A disciple of one of the masters will give the Class for the benefit of vocational students, celebrating that master, in a spirit of joy and friendship, by bringing his thought to life. Under the official aegis of FRANCE-RUSSIA 2010, the series opened on Saturday 14th November 2009 with a celebration of Nina Vyroubova. With the generous support of Gaynor Minden Inc.